Nearly one in four US children lives in poverty, the highest level in 20 years, with a similar proportion not getting enough food to eat. These were among the findings of an article published last week in the medical journal JAMA Pediatrics, entitled Seen but Not Heard: Children and US Federal Policy on Health and Health Care. While the Obama administration praises the “economic recovery,” the facts presented in this report show that since 2009 there has been an immense social retrogression in every measure of well-being among the most vulnerable section of the population: children. “It shouldn’t be this hard for kids to grow and thrive in the world’s richest, most powerful nation,” said Bruce Lesley, one of the study’s co-authors and the president of the child advocacy organization First Focus. 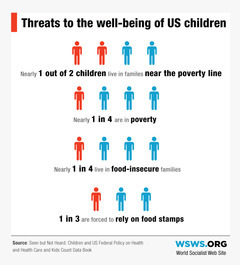 The report listed a panoply of dangers to the health and well-being of children in the United States, including hunger, lack of health and mental health care, cutbacks in social spending, the havoc wracked on immigrant families by deportation, and others. It found, among all these, that by far the worst impact on the health and well-being of children is poverty. The report notes that there is overwhelming popular support for government programs to fight child poverty: “82% of voters want Congress and the White House to cut child poverty in half within 10 years.” But with the upcoming midterm election only a week away, such a project could not be farther from the minds of US politicians. The Obama administration’s 2015 budget proposal, for example, calls for slashing the budget of the Department of Health and Human Services, which funds the Head Start preschool program, and the Department of Agriculture, which administers the food stamp program, by more than five percent. The report also noted that seven million US children, or nine percent, have no health insurance. Despite this, the Children’s Health Insurance Program, jointly funded by the states and the federal government, is scheduled to have its funding drop by 73 percent, from $21.1 billion to $5.7 billion, in 2016. Among the most tragic elements depicted in the report is the effect of mass deportation on children. It noted that between 2010 and 2012, under the Obama administration, more than 200,000 parents of US citizen children were deported. As a result of these deportations, more than five thousand children have been put in foster care. The report notes that one in three US children are overweight—which it refers to as a “pandemic”—and that 17 percent are obese. It relates these health problems to insufficient access to healthy food, both as a result of poverty and cutbacks to the funding of school lunch programs. One in five children have mental disorders, and the rates are growing. “Pediatric mental-health and substance-abuse hospitalizations increased by 24% between 2007 and 2010, and hospitalizations for mood disorders increased by 80% between 1997 and 2010.” Suicide is the leading cause of death among teenagers, and rates have gone up since the start of the recession. Despite the widespread prevalence of mental illness among children, only half of US children with mental disorders receive any form of mental-health services, according to the report. On the state level, more than $1.6 billion in funding for mental health services have been slashed between 2009 and 2012, resulting in the elimination of 4,000 psychiatric hospital beds since 2010. Whole areas of the country simply have no mental health care available to the poor, who tend to suffer disproportionately from the effects of mental illness. The report notes “35% of US counties have no outpatient mental-health treatment facility accepting Medicaid.” Only three percent of psychiatrists who practice alone accept Medicaid. Despite the disastrous prevalence of poverty and preventable disease in the US, funding for medical research is being slashed. The report noted that the sequester budget cuts slashed $1.57 billion from the National Institutes of Health (NIH) and $289 million from the budget of the Centers for Disease Control and Prevention. The report is a devastating indictment of a society that is going backward, not forward, in every measure of social well-being. These disastrous cuts in social services, supported by both Democrats and Republicans, are accompanied by the enormous enrichment of the super-wealthy, who have doubled their net worth since 2009.